Towards the end of sci-fi hit Interstellar (2014), Jessica Chastain’s humble Hamilton wristwatch became a key plot device when its ticking second hand was used to transmit a message (in Morse code) that could save all humanity. In that pivotal scene — a eureka moment that tied in neatly with the film’s themes of space and time travel — all eyes were naturally drawn to the Hamilton logo prominently emblazoned across the face of the leather-strapped timepiece. With its timepieces playing such a major role in the film — the other lead, Matthew McConaughey, also wears one — Hamilton left an impression on not just watch enthusiasts looking for the next It piece of wrist candy, but also fans seeking to own movie memorabilia. And it is not the only brand to have its products thrust into the spotlight after a big-screen cameo. Who could forget the diamond and ruby necklace designed by French jeweller Fred that was worn by Julia Roberts to the opera in Pretty Woman (1990)? The stylish Jaeger-LeCoultre Reverso watch worn by Christian Bale when he played Bruce Wayne in The Dark Knight (2008) — earning the brand some superhero street-cred — or the sleek black IWC Schaffhausen Pilot’s Watch Double Chronograph Edition Top Gun timepiece favoured by Jeremy Renner’s lead character in The Bourne Legacy (2012)? Considering mainstream cinema’s mass appeal, star-studded casts and international reach, it is no wonder that some jewellery and watch brands are happy to be cast in a supporting role. Take, for instance, the roll call of Tiffany & Co. designs that filled the wardrobes of Baz Luhrmann’s The Great Gatsby (2013). Carey Mulligan (who played Daisy) dazzled in an exquisite headpiece adorned with sparkling diamonds and lustrous pearls accompanied by an assortment of necklaces and bracelets, while Leonardo Dicaprio (Gatsby) looked debonair in the brand’s gold cufflinks and signet ring. The film’s supporting characters also shone in the American jeweller’s lavish creations, with Elizabeth Debicki (Jordan Baker) looking particularly stunning in her diamond chandelier earrings, sapphire rings and pearl bracelets. That same year also saw the release of Diana — a biopic of the late Princess of Wales — which was an equally glitzy showcase of well-known brands such as Chopard. While the movie was panned by critics, the Swiss jeweller left more than a fleeting impression on audiences with its exquisite gems, some of which were modelled after the princess’s own. Standout items included a triple-strand diamond necklace and a pair of sapphire earrings based on the royal’s famed sapphire engagement ring surrounded by solitaire diamonds and set in 18k white gold. Apart from Diana, Chopard has also designed jewellery for films such as Nine (2009) and Midnight in Paris (2011). The brand’s collaboration with the franchise started in 1995’s GoldenEye, in which Pierce Brosnan, cast in the titular role, used the built-in laser of his Seamaster Quartz Professional 300M to slice open the door of an armoured train on the brink of explosion. “It’s been a very successful association — in terms of sales — but also in terms of image,” said Omega’s President Stephen Urquhart in a 2012 interview with The New York Times. Bond Street jeweller David Morris has also long been linked to the Bond series. Thanks to its friendships with Roger Moore and Maurice Binder, the title designer who worked for 14 James Bond films, its jewels first appeared in 1971’s Diamonds Are Forever and have been worn by a number of Bond girls such as Teri Hatcher and Denise Richards. Other brands have chalked up their share of movie cameos in recent years too: Hamilton of Interstellar fame has provided timepieces for over 400 films while Florentine watchmaker Officine Panerai’s designs were made popular by Sylvester Stallone, first in his Rambo series and then in the Expendables trilogy (2010-2014). And later this month, when action flick Kingsman: The Secret Service hits cinema screens here, its stars Colin Firth and Michael Caine will don timepieces from Bremont Watch Company, which has created a collection of rose gold and black chronographs specially for the movie. Scheufele’s comments couldn’t be more apt, considering the auction prices for certain movie memorabilia as well as the demand even their replicas enjoy. Take, for example, the Heart of the Ocean necklace designed by British jewellers Asprey & Garrard (now known as Garrard & Co) in 1997 for Titanic. While the film prop was set with cubic zirconia, the post-shoot commissioned necklace (also by the same jeweller) featured a heart-shaped Ceylon sapphire surrounded by diamonds. It was later donated to a Sotheby’s charity auction and sold for some US$2.2 million. There was also the Heuer (now known as Tag Heuer) Monaco horologe worn by actor Steve McQueen in the racing film Le Mans (1971), which sold for US$799,500 — an impressive amount, considering that the automatic chronograph is still in production. With the Academy Awards just round the corner, luxury brands are now prepping for their next grand showcase — the moment when celebrities walk the red carpet decked in their jewellery and timepieces. But for labels that actually contributed to cinematic history this year, perhaps, the icing on the cake is knowing their designs have been forever immortalised in film. 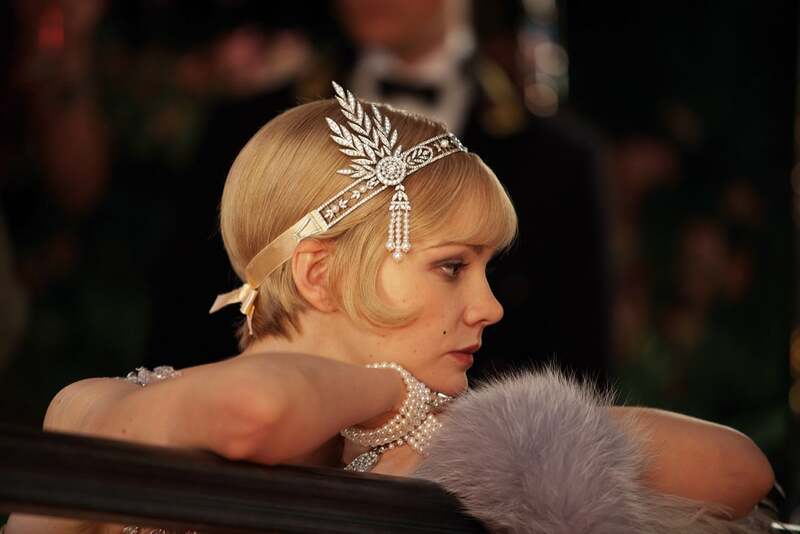 Carey Mulligan in The Great Gatsby. In the movie, McConaughey wears a Hamilton Khaki Pilot Day Date watch.